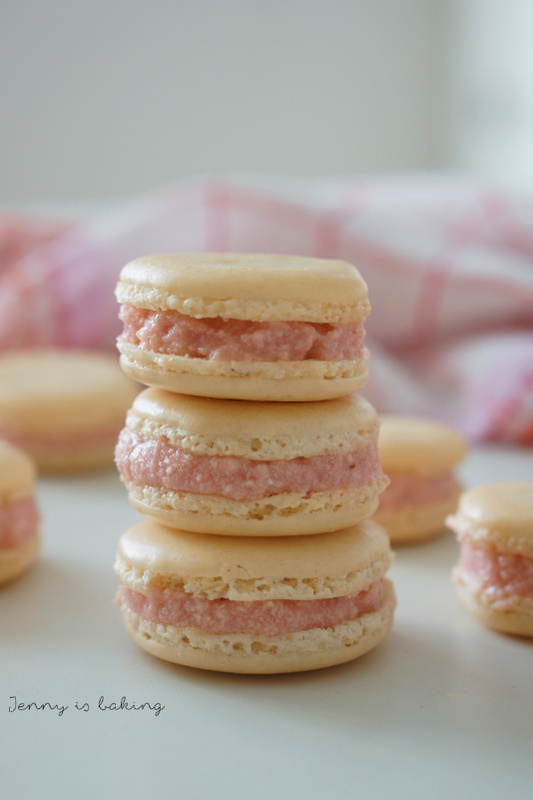 Check out macaron recipes, you will be surprised to see how many claim that the shells actually have some kind of flavor when in fact all their “flavor” comes from a few drops of food coloring. No, thank you. These macaron shells are plain, because plain is wonderful. If combined with a super flavorful strawberry buttercream. Trust me. And the buttercream! Ever heard of Ermine frosting? It is frosting based on flour. Yes, you read right. You first create a base with flour and milk and that serves as the thickener for the butter. Because then you don’t need as much sugar to get a pipable consistency. Oh, and of course you add reduced strawberries to it because we want the real deal. 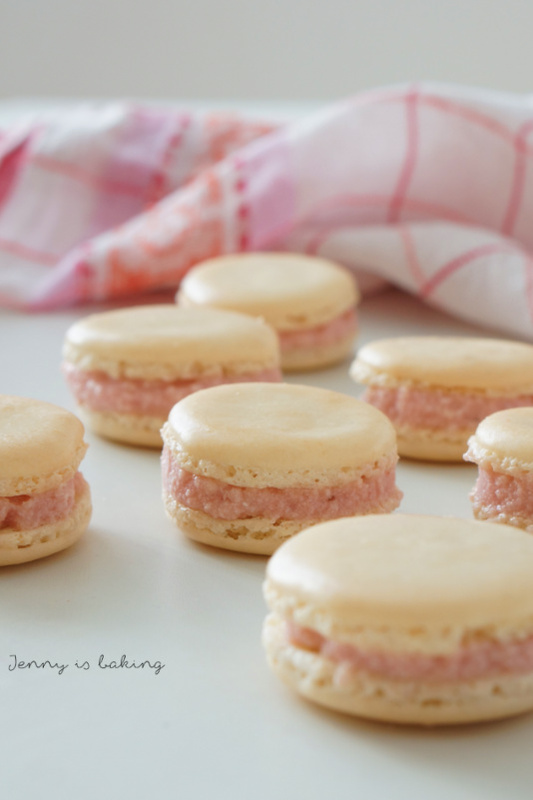 People, let’s create some pink color with these strawberry macarons with no additional food coloring! For the buttercream wash, slice and puree fresh strawberries. If using frozen ones, heat up first and then puree. Let simmer for about 20min and liquid has reduced substantially. The consistency should be close to jam. Set aside. Now whisk flour, sugar, and milk in a pan and heat up at medium heat while stirring. It should thicken within a minute or so. Cover in plastic wrap until further use. (Note: this step can also be taken when macaron shells are done): Beat the butter for about five minutes, then add the flour mix, one tablespoon at a time. Once combined, add three tablespoons of reduced strawberries and beat until you have a pipable cream. If too runny, place in the fridge for the butter to harden a bit. For the macarons if you forgot to take out the eggs on time, leave them in warm water for a few minutes, then separate them. Choose a metal or glas bowl for the egg whites and make sure it is clean and free of any grease. Put the almonds and icing sugar in a food processor and process for a minute. Sift into a bowl. Don't skip this step. If you have larger almond chunks, put them back into the food processor, process and sieve again. Weigh the regular sugar and put aside. Now start beating the egg whites with a mixer on low for two minutes. Add the salt once they look foamy. Switch to medium speed for three minutes. Once you have soft peaks, add the sugar. Change to high speed for another three minutes. Your meringue should look glossy and form very stiff peaks. Add the almond/sugar mix to the meringue all at once and start folding with a spatula delicately. Once you are happy with your macronage, prepare two baking sheets with parchment paper and circles the size of a 2-Euro coin onto each. 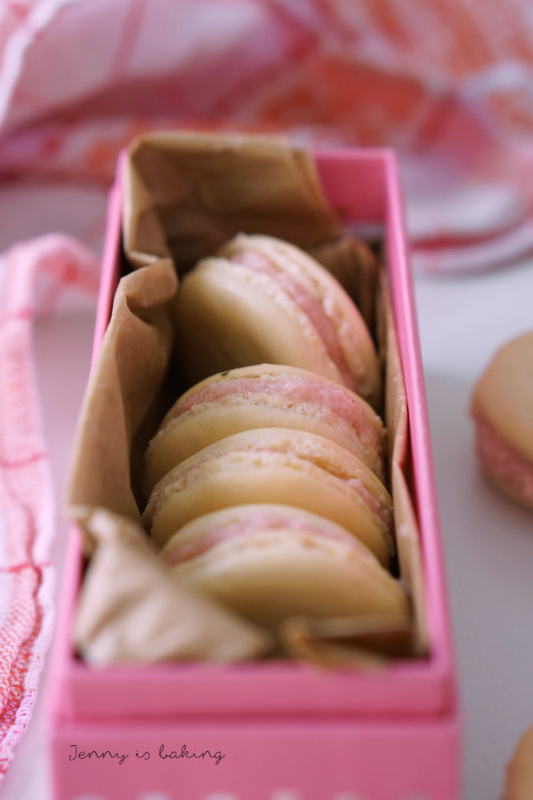 You should be able to fill both baking sheets with macarons. Once you are done, rap and bang the baking sheets to get out any air bubbles. If the macronage has the right consistency, for example any "swirls" will move back into place. 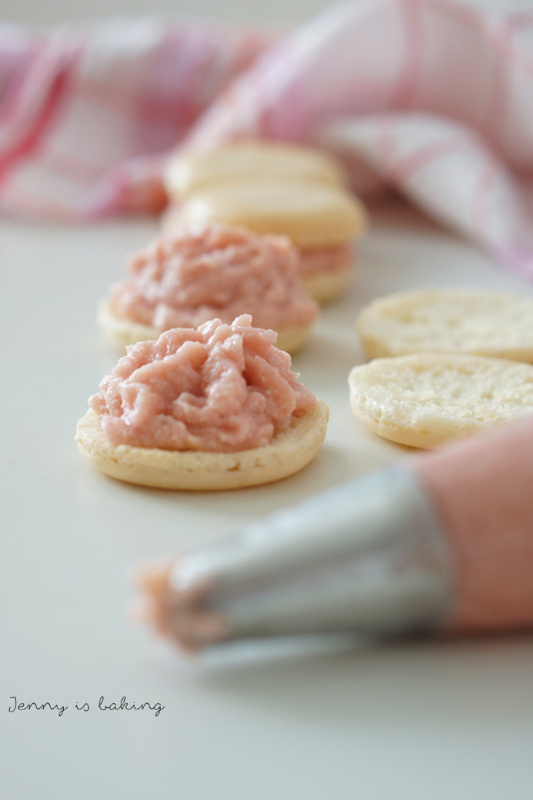 Let the macarons sits between 15-20 minutes. This will help them dry and also help to create a shell so they rise properly. If you happen to live in a humid place (I have had problems here in Hamburg), turn on your oven to 120 degrees Celsius, turn off the oven and place both baking sheets in the turned off oven instead. If you touch the macarons with your dry finger, they should feel dry. Take out both baking sheets. Preheat oven to 145 degrees Celsius meanwhile. Let cool completely before filling with strawberry buttercream. No idea what to do with the leftover egg yolks? Check out see this blog post including how to freeze them properly. Prepared macarons are kept best in an airtight container in the fridge. They will get soft after about 2 days. Macarons also freeze beautifully. I like to freeze the macaron shells. Take them out 20 minutes before serving. Thank you, Laura! They taste just like strawberry! 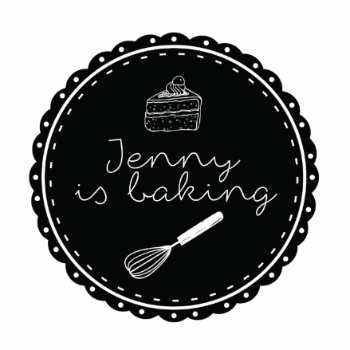 Hi Jenny, das #sonntagsglück hat mich zu dir geführt und ich bin gleich mal fasziniert: Deine Macarons sehen wunderschön aus! Ich finde die zarten Farben dabei gerade schön. Die brauchen sicher keine künstliche Farbe! 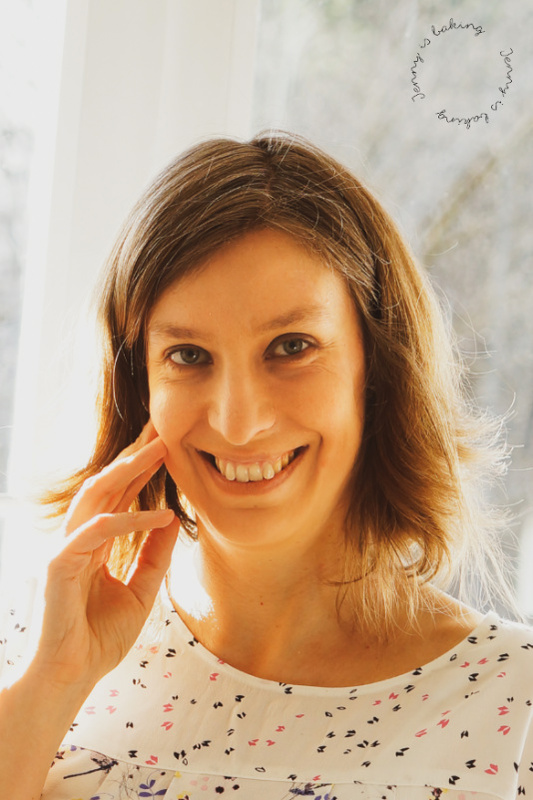 Liebe Simone, das freut mich zu hören! Melde dich gerne, wenn du sie nachbackst!